Marvin’s Cave – Caving in Ontario, originally uploaded by Mic2006. We visited a beautiful – pristine marble cave in Northern Ontario this week. The cave had initially been discovered in 1964 by Bob Burns and it was documented the following year in an archive that was managed by Derek Ford. The last visitors to this cave were Marcus Buck and Brad Wilson who spent the time to make a highly detailed map of the underground tunnels. This cave had been known by another name, but we had to change it to protect it’s location (on the advise of Brad and Marcus) The new cave name is after the former owner of the cave who has since passed away. By its most simple understanding, the rock in the area dips quite steeply into the earth and there is a large swamp with a dry valley running parallel to it. We began our search for the cave based on Marcus’s memory of his visit many years before and so we made a few wrong turns before we finally found the cave. Whereas it is relatively easy to predict cave entrances in limestone – whose surface topography depicts what lies beneath quite accurately – here in the north, the contortions of marble and calcite veins are not so simply seen upon the surface. On the bright side, we did find a small sink point in the dry valley that might justify a second look. See the video of Marvin’s Cave here. 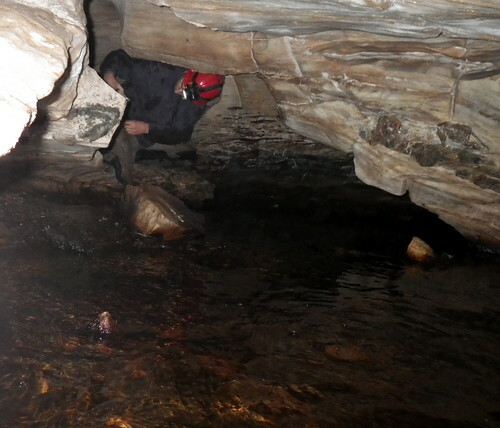 When we first stumbled across Marvin’s Cave we actually came upon the point where the upper cave took water directly from the swamp, broke onto the surface for a short distance and then dropped down through a series of crevices into the lower system. Marvin’s Cave is typified by a number of small cataracts that move its stream beneath the edge of a small escarpment in the forest. JC and I made a chilly October exploration up its stream that was still darting with minnows in mid-October. 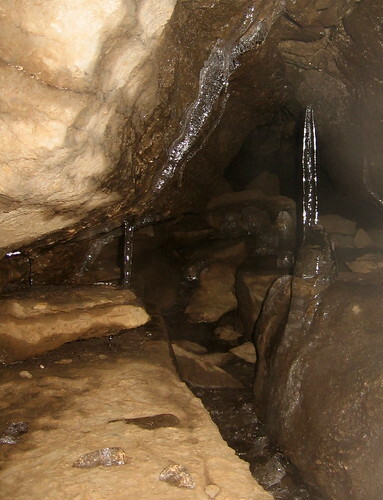 The main features in this cave are its two bowed out stream passages through incredibly banded marble. There are several sizeable rooms within the system, heavily littered with breakdown. Argument Hole – Another entrance to the Marmora Maze Caves, originally uploaded by Mic2006. Argument Hole – so named for the dispute that took place at it’s discovery and subsequent exploration (that was many years ago). JC and I had spent some time scouting along the bottom of the escarpment beside the sometimes flowing resurgence river. I was real tired and had slipped several times on ice coated rock, not to mention having fallen through several thinly covered snow roofs – beneath there were crevices of varying depths – fortunatly there was nothing that did any permanent damage. As we were leaving we decided to quickly pop into the Argument Hole and it was then that the real potential of the feature became apparent. At it’s first exploration, the hole had seemed to be going nowhere. Maybe my impression of what was tight was more finely honed at that time. Today, in following inward, the tunnel jogged deeper into the escarpment, over a crevice that had been running with water from deeper inland last time I had visited. Admittedly there is a lot of breakdown, but up ahead, past this mid passage icicle there are troughs that run perpendicular to this crawl way and down which water flows parallel to the resurgence valley. Further exploration is dependent upon the stability of the tunnel. Check out my video on caves that JC and I made here – It is a brief discussion on Argument Hole, Another Entrance to the Marmora Maze Caves. Also see my book on caves here – ‘Caving in Ontario; Exploring Buried Karst’. 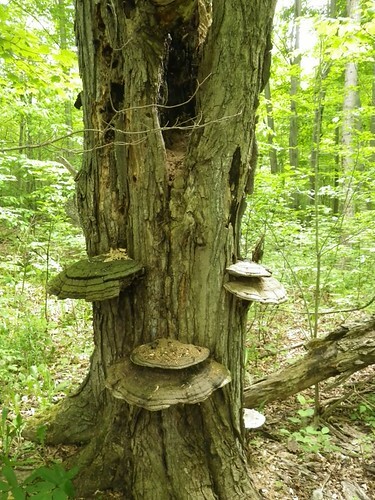 Marmora Karst – Geology of Ontario, originally uploaded by Mic2006. The Marmora area in the winter (a few hours north east of Toronto) certainly gives the impression of pristine Canadian wilderness, it feels wild and remote and it certainly is most beautiful. JC and I made the 3.5 hour drive from Guelph / Hamilton this past weekend with the intention of busting open some cave passage in the vicinity. There is this escarpment that is buried under forest and beneath which we know cave passages must exist. It is not a question of there being caves, it is only a question of how to reach them. Along our route we passed over the Crowe River and beneath the water you can see the local geology, a karst landscape of weathered limestone, joints and fissures and eroded bedding planes down which the water flows. As for breaking into the tunnels that we had hoped to reach we were sadly unsuccessful. Everything was frozen together, the slabs of rock were way bigger than I’d remembered and crowbar, shovel and human effort were grossly ineffective. On the bright side we have scouted what appears to be a simpler underground route, a tunnel that is partially clogged by boulders, but which could be clearable with about a day of effort. I believe we could wiggle along a bedding plane and soon reach the spot that up until this weekend seemed only accessible beneath about 100 tons of rubble. In addition to the escarpment connection tunnel, JC and I also pushed a previously known connection that we had called Argument Hole and discovered that it continued on – possibly into the upper tunnels of the Marmora Maze Caves. 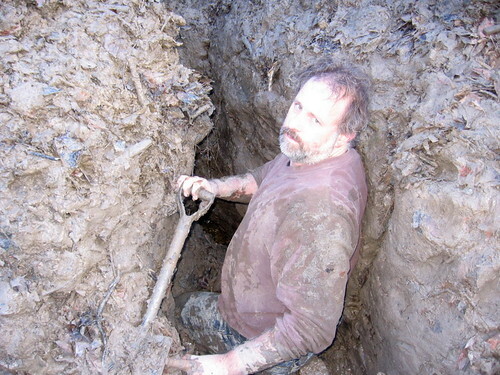 We had been avoiding the traditional entrance that Josh and I had uncovered some years ago as it looks unstable and a visit is hardly worth being buried alive. 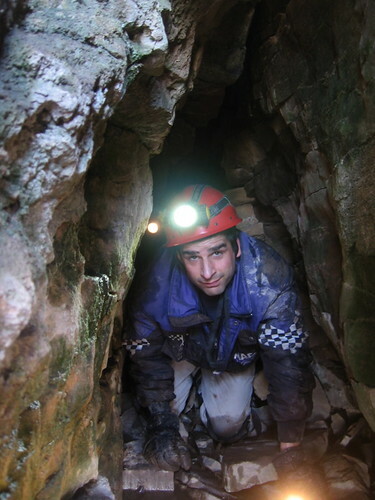 Learn more about the Marmora Maze Caves and their discovery in my book ‘Caving in Ontario; Exploring Buried Karst’ here. So for a winter exploration near Toronto, I’d say we had a pretty successful day, but now a day later I feel absolutely shattered and I believe JC can hardly feel to much better – he’d wrenched his shoulder when the ice gave way along the escarpment edge and he fell into a crevice. I’ve felt like I’ve had lead weights attached to my limbs all day and no matter how high I crank the heat up, I still feel like I’m sitting in a snow drift, and the toes, they haven’t recovered from the hours long submersion in the ice melt that had trickled into my boots while I was crawling down iced-in cave passage – see a picture of some tunnel in the area – here and here. 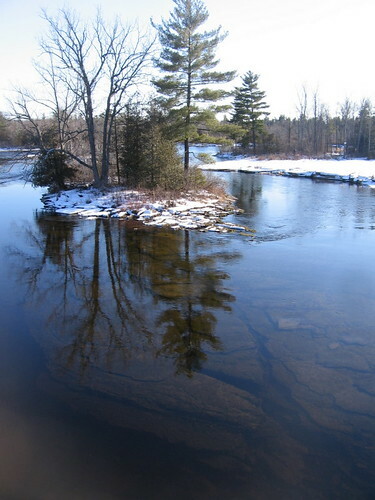 Check out this video that I’d taken – showing something of the Marmora area, and also this video that shows one of the places where water sinks underground beneath a shattered karst landscape – Ontario karst landscape here. Natural cave gate, originally uploaded by Mic2006. Last weekend we enjoyed a feeble sunshine and weather that made it seem like spring was just around the corner. On a plateau that was totally cleft by grykes and pocked with sinkholes we found a joint that had several likely entrances into the underground. Jeff also explored a crevice cave that soon became a solution passage. 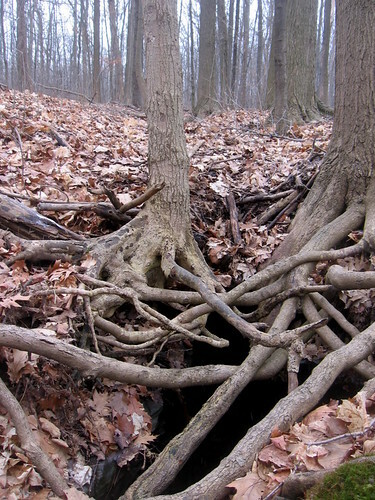 This is an intriguing shot of tree roots that spider over top a water worn crevice on the surface. As you can see the soil is thin and tree roots block entrance to this crevice. No big deal, it looks like a natural cave gate, and a short distance further in the tunnel is blocked by sticks and twigs. It seems that the water percolates through many fractured rocks and leaves the nearby clifface from multiple locations. It’s not that the rock is un-cave like, its just that the water remains unconcentrated. When wear is spread over so many possibilities, the tunnels can only be small and crawley. For good cave tunnels you need nice thick layers, less joints and fewer points of water entry. That natural cave gate hardly brings me much concern. In what they are calling a potential flash freeze, Wolfmaaan, JC and I are preparing to do a wetsuit crawl in some very exciting circumstances. Weather and courage permitting I will have some amazing cave pictures by tomorrow night.